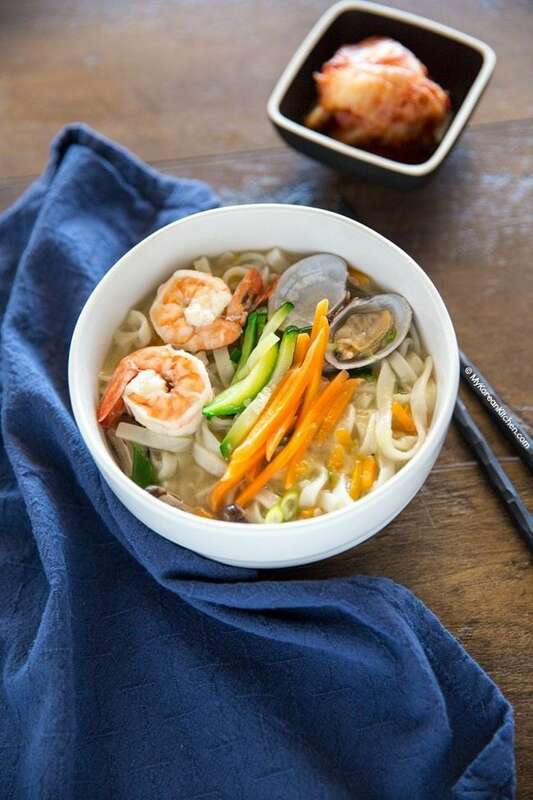 Kalguksu (Korean knife-cut noodle soup) is a light, refreshing and comforting noodle soup. It will warm your heart, mind and soul! Kalguksu (Korean knife cut noodle soup, 칼국수) is one of my favourite noodle soups. Unlike Jjampong / Jjamppong (짬뽕, Korean spicy seafood noodle soup), Kalguksu is not spicy. One of the highlights of this noodle soup is the handmade knife cut noodles. 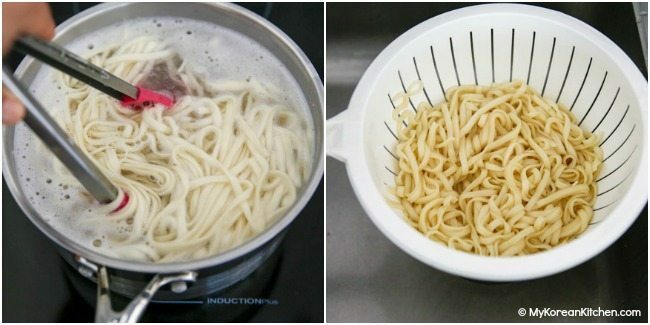 These noodles are thin flat shapes and have a bouncy texture. Though, I normally buy pre-made Kalguksu noodles from a Korean grocery store, because if I were to make them at home, it will add about 1 hour of additional cooking time. Nonetheless, I’m fully intending to share the “made from scratch” version of the noodles, so stay tuned! There are a few variations of Kalguksu, but my number one choice always has been Bajirak Kalguksu (바지락 칼국수, Knife cut noodle soup with littleneck clams). I don’t know what it is, but I love the light and refreshing taste that comes out of this little seafood. Since I’m a seafood lover, I often throw in some prawns as well. But, if you’re not going to add the prawns, just add more littleneck clams. I’ve seen some Koreans adding squid or baby octupus in their soup, which looks so tempting. 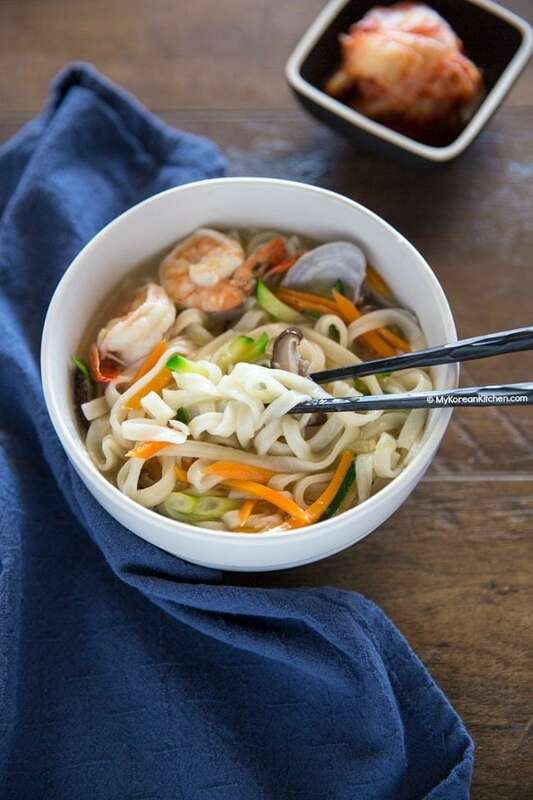 If my seafood choice is more than just littleneck clams, I would call it, Haemul Kalguksu (해물칼국수, Knife cut noodle soup with seafood). There’s also Dak Kalguksu (닭 칼국수, Knife cut noodle soup with chicken), this soup has a lot deeper and meatier flavour. Typically these types of meaty soup are additionally seasoned after you serve it. Since the Kalguksu noodle and soup is mild, the best combination with it is obviously, Kimchi! It particularly goes very well with freshly made Kimchi salad and also with cubed radish Kimchi (Kkakdugi). Kalguksu is warm comfy food. I particularly love having it on a cold rainy day and in winter. It will warm your body up for sure! Hope you enjoy my recipe! 1.Boil the anchovy and kelp stock in a pot on medium heat. Add the soy sauce, minced garlic and salt to season the stock. Once the stock is rolling boiling, add the zucchini, carrots and shiitake mushrooms and cook until lightly softened (about 2 mins). Then add the clams and prawns and boil until they’re cooked (about 2 mins). Make sure you don’t over cook them as they can get gummy. 2. 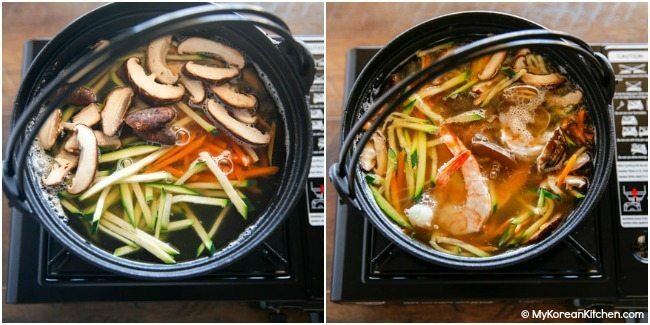 (Ideally at the same time as step 1) In a separate pot, boil the noodles in rolling boiling water until cooked (2 to 3 mins). Drain and rinse with cold running water. Set aside. 3. Add the noodles into pot 1 (from step 1) and boil for one minute to make the noodles warm. Stir around. Add the green onion and turn the heat off. Serve while hot. If you’re using water instead of the anchovy and kelp stock, you will have to add more soy sauce and/or salt to season the soup as it will lack flavour. Though, if you add too much soy sauce the colour of the soup will be turn brownish. The typical colour of this type of Kalguksu soup is close to clear. 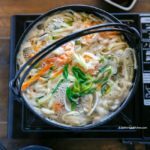 Kalguksu (Korean knife cut noodle soup) recipe. Boil the anchovy and kelp stock in a pot on medium heat. Add the soy sauce, minced garlic and salt to season the stock. Once the stock is rolling boiling, add the zucchini, carrots and shiitake mushrooms and cook until lightly softened (about 2 mins). Then add the clams and prawns and boil until they’re cooked (about 2 mins). Make sure you don’t over cook them as they can get gummy. 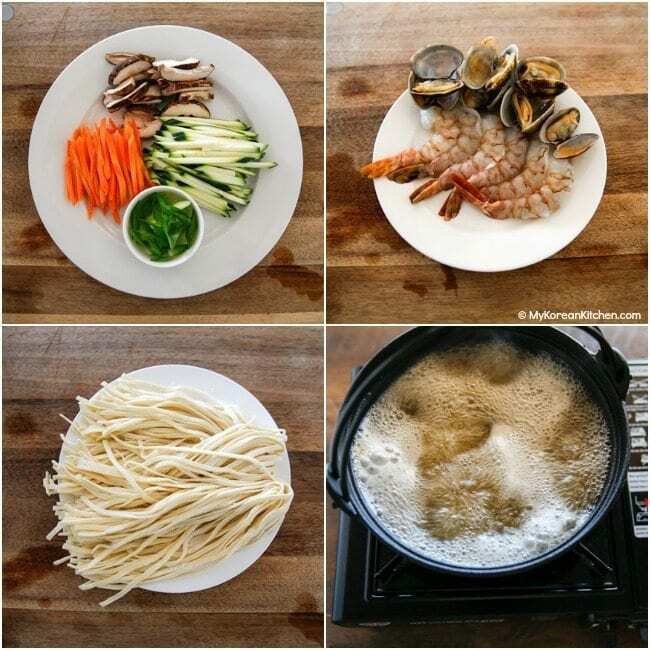 (Ideally at the same time as step 1) In a separate pot, boil the noodles in rolling boiling water until cooked (2 to 3 mins). Drain and rinse with cold running water. Set aside. Add the noodles into pot 1 (from step 1) and boil for one minute to make the noodles warm. Stir around. Add the green onion and turn the heat off. Serve while hot. When I was young, I often went to an old knife-cut noodle place after school which was right next to my school. They had a really good food and it was cheap too. When I ordered noodle, It served really quickly, so I could eat fast and go back to study. For me this food is my childhood favorite food. I wish I go back and eat that noodle again. Of course I can make it by myself with this recipe that you posted but still I miss that noodle store a lot. Thank you for sharing this recipe. My daughter and I love Korean Food, so I am always lookimg for our next food adventure. This recipe looks and sounds awesome, however I am not a seafood eater, can’t get past the smell. Can I substitute a different meat for the clams and shrimp? Hi Marget, you can substitute the seafood with different meat and a popular choice is chicken. You probably should check out this recipe instead then. 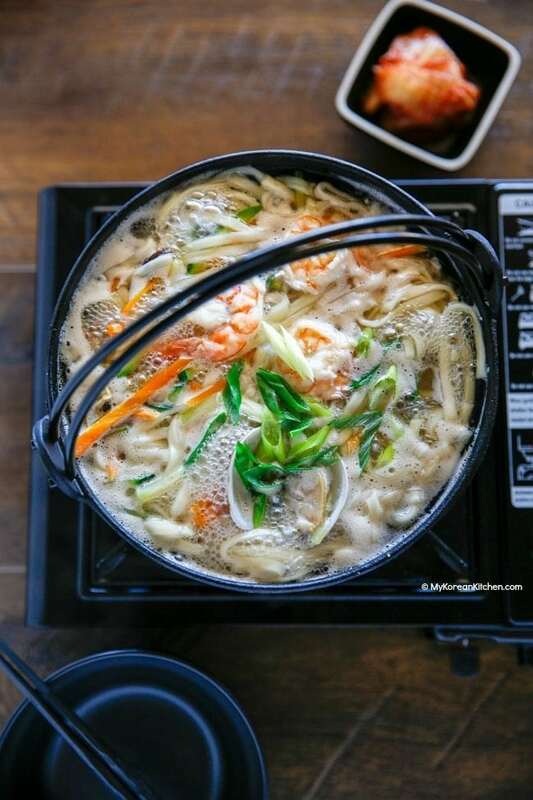 https://mykoreankitchen.com/chicken-noodle-soup-dak-kalguksu/ Obviously they do taste different. 🙂 Enjoy! Hey a really great website! Was just wondering what portable cooker you are using here? How good is it? And what your suggestions are for the best portable stove. Thank you so much. I love your recipes! 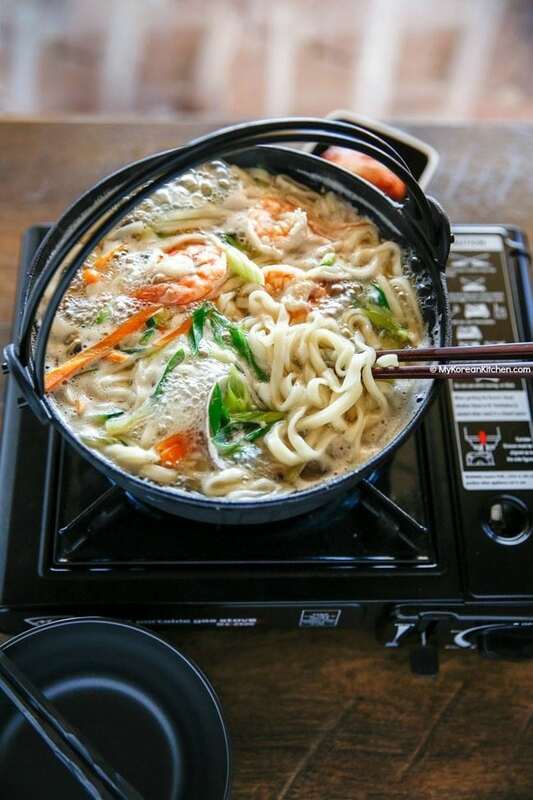 I use this stove for my Korean BBQ as well. Very convenient! Great simple dish ! Great photos too ! Thank you and have a pleasant week ¨!